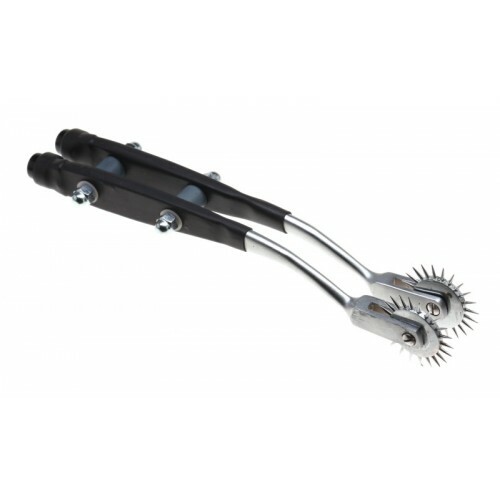 The E-Stim Dual Pin Wheel. Takes skin play to the extreme, mixing the tease and torment of the Wartenburg wheel with e-stim. Wheels of pins pricking your skin, each spike stimulates nerves and delivers electrical current for an intensive electro nerve response. This electrode is bipolar meaning they can be used alone without the need of any other electrodes. Use with conductive gel to enhance conduction and the electrostimulation experience. Each wheel features an insulated handle and a 4mm socket. Connects to your control unit via 4mm cables. Comes with an E-Stim Systems 3 months guarantee.